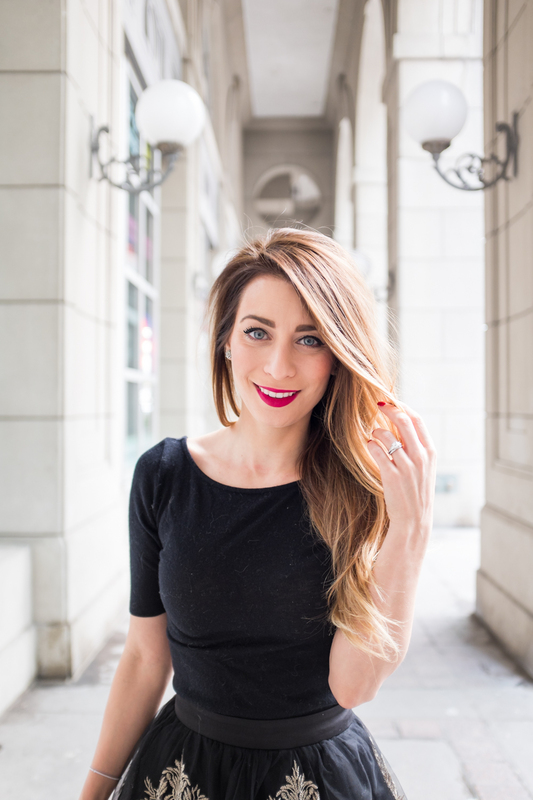 OOTD - Black Tulle Skirt | La Petite Noob | A Toronto-Based Fashion and Lifestyle Blog. With the approach of Valentines Day, there's definitely been an explosion of bright, festive colours not only in stores but also in the blogosphere. While I'm definitely guilty of abusing any holiday that allows me to pair pink and red together (hello my last post) I totally understand that not everyone is into all of that cutesy stuff. Enter the black tulle skirt - just enough girly detail to be Valentines Day appropriate but with some edge. Paired with a black skirt and booties, this tulle number will either make you comfortable dressing for Love Day, or want to audition for the lead in 'Black Swan' - and hey, either is good with me! These Italian leather, hand-made babies are my recent obsession from Le Chateau and I quite literally can't get enough of these booties. A sleek, pointy toe boot can pair well with everything, and is a great alternative to a pump in the winter months. What do you guys think? Are you all about that red and pink, or do you prefer the all-black palette for Valentine's Day. Do you think I have a shot a snagging the lead role in Black Swan? Let me know! This outfit is so fabulous and sleek! You are totally making me reconsider a black approach. And the pink lip is so perfect! Thank you so much Gabriella, I'm so happy that you like the all black! Who can say no to a tulle skirt? LOVE! So unique and edgy but just feminine enough! You look amazing! Thank you so much love! I have a hard time pulling off the all-edgy look, so this was a nice compromise! Ah! Ottawa is my hometown, so I totally feel you on the snow clearing! Toronto seems tropical in comparison LOL! That skirt is so pretty! You have such a pretty, feminine sense of style. This look is amazing! I love how you added a nice bright lip too. Those boots are to die for! Still can't get over how beautiful that skirt is and you looking amazing! Love this look! Love love love the booties! I may have to snag a pair! Despite my love for all things pink I somehow always end up wearing black for Valentine's Day :-) strange right?! Yes, definitely snag a pair for yourself Gigi they're incredible - and on sale! I'm exactly the same - I LOVE colour, but can often be found in all-black LOL! I'm totally with you Lauren - I love bright colours, but my closet is made up of mostly black, neutrals and pastels LOL! So glad that you like this outfit! You sure know how to pull a skirt off, this is so delicate and pretty. Thank you Filipa! Call me old fashioned, but I'm so much more comfortable in a skirt than I am pants. So weird right?! Thank you so much Kris! I'm loving the black tulle as well!